Thanks very much for subscribing to SCUBA News. 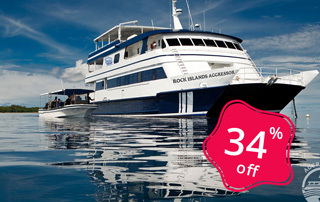 This month a massive discount on liveaboards. Aggressor's 34th Anniversary party starts now! Book and deposit on a new reservation till Nov 24th for travel until April 2018 and SAVE 34% on Aggressor Liveaboards Worldwide! Which Honduras Island is best for Diving? The best diving in Honduras is in the Bay Islands - Roatan, Utila and Guanaja. But which one to choose? Those brave enough to dive in Oman's as yet little know waters will be interested in a great new App for iPhone and iPad just published by Richard Field and John Hoover. John Hoover dived with Jack Randall to produce the fish bible for Oman, Coastal Fishes of Oman, whilst Richard Field wrote the excellent identification guide for divers titled Reef Fishes of Oman. You can download it from the iTunes Store. The app contains descriptions of 470 species with 900 Photos, ranging from Khasab on the Arabian Gulf to Salalah on the Yemen border. It contains fish from the Gulf of Oman, the Arabian Sea and the Persian (Arabian) Gulf. 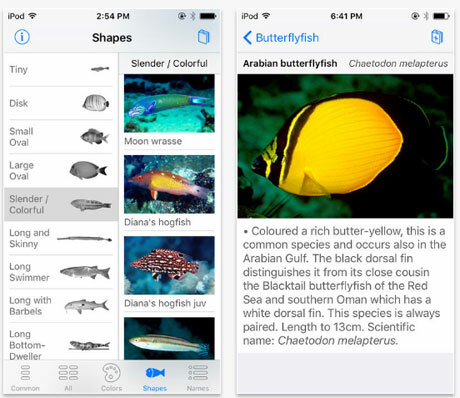 Flip through screens like pages of a book, or find a fish quickly by color or shape. There are up to 5 photos per fish - showing juveniles, males, females and colour variations. You can even use the logbook feature to record sightings. If you are interested in learning more about the diving around Oman, check out our website. Plymouth University are researching the cardiovascular health of active scuba divers to develop 'fit to dive' guidelines for scuba diving. You can help by completing an online survey. Why not teach people how to farm salmon without shooting seals instead? The distinctive sleeping behavior of the spinner dolphins has also been hindered by eco-tourism. Tourists often attempt to interact with the dolphins that rest in the bay, disturbing their sleep. Dolphins that hunt alongside humans have a different way of communicating. A newly described species of Philippine butterflyfish -- the charismatic Roa rumsfeldi -- surprised scientists with its unknown status. Our actions today will change the world's oceans for thousands of years. That is the conclusion of a study simulating a little-discussed consequence of climate change: it could choke entire ecosystems by cutting oxygen levels in the ocean. In the most extreme scenarios, with the planet warming by almost 10 oC, the oceans could be starved of oxygen for 8000 years. 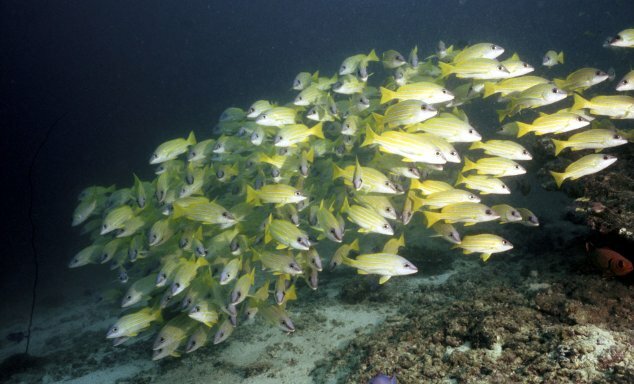 Schooling fish get another advantage than hiding from predators - more efficient swimming, and more energy for a hasty retreat.